Double-G hardware inspired by a '70s-era archival design marks the tabbed flap of a lush velvet shoulder bag detailed with the Marmont line's distinctive matelassé chevrons and finished with a stitched heart in back. The slide-through chain strap can be extended to use over the shoulder or doubled to use as a chic top handle. BLACK Leather, Suede Marmont 2.0 Velvet Shoulder Bag from Gucci. Gucci - Named for the iconic Hollywood Hills hotel, Gucci's black velvet Marmont is an enduring style that represents Alessandro Michele's more-is-more aesthetic. The quilted composition is backdrop to an antiqued gold-tone metal GG plaque which matches the sliding chain shoulder strap. Carry it alongside faded jeans to master high-low styling. Marmont 2.0 Schultertasche aus Samt von Gucci. 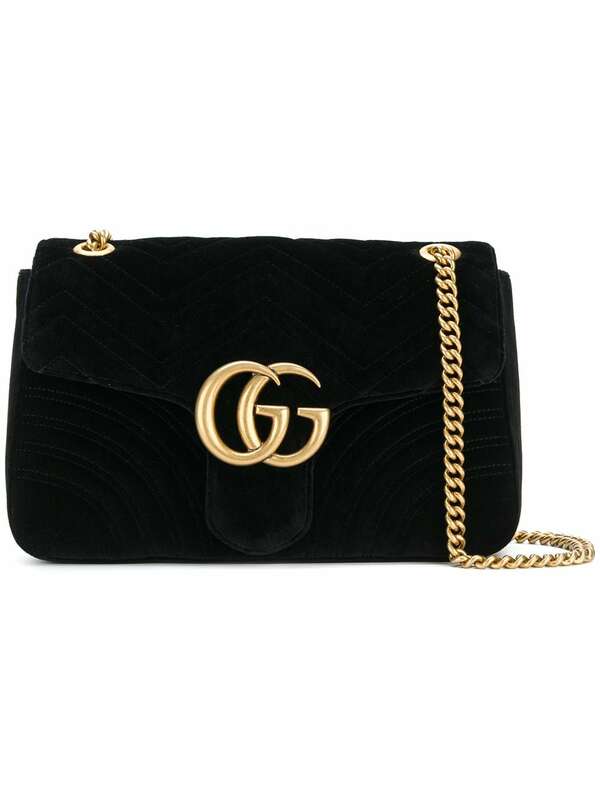 Gucci matelasse velvet shoulder bag with leather trim. Antiqued golden hardware. Sliding chain strap can be doubled, 11.8"-21.5" drop. Flap top with interlocking GG snap closure. Quilted heart on back. Interior, satin lining; one zip and one slip pocket. 7.5"H x 12.3"W x 2.8"D. "GG Marmont 2.0" is made in Italy.